The village you need to get to on the mainland to take the ferry across to Isla Holox is Chiquila. Chiquila is at the far northern side of the peninsula approximately 2-3 hours drive from Cancun. The most economical and time consuming way to get to Holbox. Use the information below for additional bus information and links. For those adventurous travelers with a rental car, drive yourself to Chiquila and follow the instructions below for additional details. 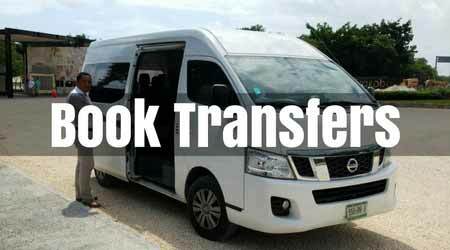 Book a full service door-to-door VIP private Holbox transfer. They will pick-you up, get you on the ferry, and take you to your hotel by taxi on Holbox. This is the way to go on vacation! Go west from Cancun on the free highway until you hit the town of El Ideal. Watch for the signs for Isla Holbox then turn North to Chiquila. Follow the signs [Isla Holbox] in El Ideal for the road to to Chiquila. SHORTCUT driving instructions to Chiquila from Cancun Airport. Drive East on Hwy 180 past Valladolid until you reach El Ideal. Follow the signs [Isla Holbox] in El Ideal for the road to Chiquila. SHORTCUT driving instructions to Chiquila from Merida. There is an Airport ADO Bus that runs approx every hour from 7:00am to 10:00pm. It leaves from the airport Terminals 2 and 3 and goes to the downtown central bus station in Cancun City on Tulum Ave.
You can drive through the jungle if you wish taking the route to Coba first then heading north. We only recommend this route to the adventurer. We have gotten lost numerous times taking this route ourselves and found it faster to simply take Hwy 307 up towards Cancun then turn West onto Hwy 180. You can of course take the jungle route. Just make sure you enter with a full tank of gas and leave in the morning [plan your drive for daylight]. SHORTCUT driving instructions to Chiquila from Playa del Carmen. There are daily departures [7:30 am, 12:30 pm, and 1:45 pm] from Cancun to Chiquila from the main bus terminal in Cancun City. The only bus we know that travels to Chiquila from Merida is a late nighter departing from Merida main bus terminal at 11 pm. You could also take a bus to Valladolid then find a ride to El Ideal or Chiquila if you had to. The 9 Hermanos [9 Brothers] and Holbox Express operate Public Ferry Services back and forth from Holbox to the mainland [Chiquila]. The cost is $100 Pesos per person each way. The crossing time is approximately 20-30 minutes and the water is generally not too rough. There are some additional boats put into service during the summer month Whale Shark season and on weekends. That's a "temporary" non-published schedule posted only on the piers in Chiquita and Holbox. Besides walking and bicycling, the primary means of transportation is GOLF CART. These handy machines carry four comfortably and can go to both ends of the island. They rent per hour or by the day. There are five major golf car rental operations on Holbox, the best being Monkey's [on the main street coming into town from the Pier] and Rentadora Glendy next to Don Antonio Internet Cafe, one block west of the Park and Catholic church.